We’ve gathered common manufacturing software features and aspects and compiled them into a requirements checklist. Use it to decide what your business needs from your next software system. In addition to the features a manufacturing software solution can offer, you should also think about aspects not directly tied to the system itself. Consider your company’s circumstances as well as those of your prospective vendors. This seems like an obvious question, but once you start to look at systems that have all the features you want and more, it can be easy to part with your original financial restraints. However, it’s important to keep how much you’re willing to spend in mind and to stay vigilant about ROI. While very large manufacturing software systems do a great job at supporting major operations, you don’t want to end up with a multitude of features that go unused. If you decide to spend more than you originally anticipated, make sure all the extra features driving up the cost are necessary. Most of the top players in manufacturing software make products that can be flexible and utilized in several industries. However, you still want to make sure your next system is specifically recommended for your industry or your vendor has experience working with companies like yours. It’s helpful to look for case studies with data and statistics so you can find out how well a certain vendor performed in the past. How Stable Will This Vendor Be? This question goes hand in hand with vendor experience. Software vendors are more than the company you buy your system from. You should consider them a business partner, especially if you operate on an enterprise level. It’s recommended to do some research on their business practices and see if your vendor is willing to invest in your system and software category or if they’ll be quick to sell. Manufacturing software historically has focused on the business functions that support production, such as accounting. But today’s solutions allow the same control and planning over your shop floor that users enjoy with financial management. So there’s no reason why production management shouldn’t be a top priority when searching for a new system. This feature contains the tools to manage planning and scheduling, quotes and estimations, and capacity planning. Additionally, this module can provide visibility into your shop floor and provides time tracking and labor management. Tying in your production management with the system that manages all other aspects of your manufacturing operations allows more efficient management overall. After managing your production processes, managing the accounting behind them should be your next highest priority. Basic systems offer tools to manage accounts payable, accounts receivable, and billing and invoicing. Tax management solutions are sometimes standard, but it’s not uncommon for vendors to rely on a third-party application for tax preparation. Bank reconciliation is also available to ensure your records match. More advanced solutions may also offer budgeting and forecasting tools to help your business get a better idea of the road ahead. You may also wish to shop for a system that can handle accrual-based accounting, so you can better understand your company’s profitability. Financial management tools work hand in hand with accounting but provide more visibility and insight rather than tools to maintain your operations. For instance, activity-based costing features allow users to understand exactly where and how resources are used within a company. The data that comes from activity-based costing can then be used to bolster your budgeting and forecasting tools since you can see clearly how much each process costs. Financial management allows users to generate payroll and analytical reports as well. Supply chain management tools facilitate communication and streamline efforts between manufacturers, their suppliers and their customers. 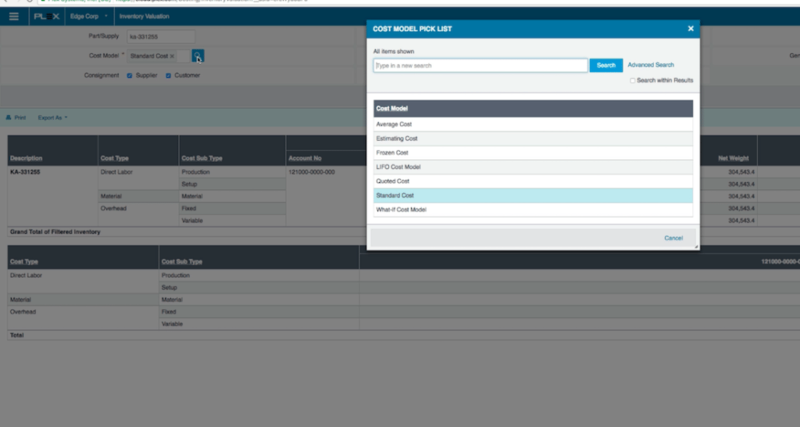 First, self-service portals allow users to securely manage quotes, POs and inventory levels. SCM tools also allow users to forecast demand and estimate production volumes. They also manage bids and enable customers to configure a product online. WIth regards to manufacturing, transportation tools help manage fleets and optimize inventory levels. A common tool offered by vendors is GPS for up-to-the-minute visibility on company vehicles and drivers. Additionally, solutions can provide users with data on mileage and send directions to your drivers for the most successful transportation of goods. Furthermore, these tools ensure the correct levels of raw materials using historical demand. This data typically comes from sales records and other consumption stats. Logistics secures an efficient and accurate transport of the goods needed for production. Managing your assets is a critical function of manufacturing. It’s important to know where your assets are and their condition so you can keep producing at full capacity. Top-rated solutions should manage your assets through their entire lifecycle including scheduled and preventative maintenance. Many systems also help companies monitor and reduce energy costs. For more advanced asset management, you should look for a system that can manage parent/child relationships between assets, perform valuations and provide depreciation calculations. Manufacturing project management assists companies in tracking business operations and resources on a long-term basis. Many systems are built on Agile project methodology. This allows users to break down tasks into iterations to ensure quality and increased input from multiple factions. Gantt charts may be used along with Agile principles, to quickly convey project schedules to users. Gantt charts are also useful when users need to know the context and relationship between multiple project timelines. This enables your company to more efficiently spend its resources across all projects. These tools help track your inventory, manage requests and dispatch materials for production. Like many typical inventory management solutions, manufacturing systems also take advantage of barcode technology for quick and simple tracking of your materials. A manufacturing solution also provides a comprehensive list of all your materials available. Moreover, some systems enable users to integrate data from purchasing, manufacturing, sales and accounting to assist in planning. These tools allow users to plan the need for raw materials ahead of time to minimize scheduling issues. To ensure your product gets to your customers in a timely manner with as few errors as possible, you need order management software. Order management provides tools that help from order entry to delivery. Many systems have automated much of this process to reduce human error wherever possible. Automation also streamlines your order fulfillment, as it reduces the amount of labor necessary to get a product to the customer. Additionally, this type of software enables users to easily track customer orders and quotes. Users can see invoices sent out to customers as well as billing information already received. Tracking orders gives users a better understanding of the delivery timeline and the issues that may occur and cause delay. This is an especially important tool to have, as 84 percent of consumers trust online reviews as much as they trust a friend. In today’s online world, customer satisfaction needs to be a top priority. As mentioned in the section above, the internet’s presence in today’s supply chain is impossible to ignore. With massive players like Amazon offering products online to customers that can be shipped right to their door, it’s advisable that your company do the same. Maintaining an eCommerce presence also provides more channels through which your business can make profit. Having a manufacturing software that can provide the tools necessary to do this is very useful. Manufacturing software suites typically offer a shopping cart feature to enhance the user’s experience. ECommerce tools should also provide a way to customize prices and the design of the interface. Providing an enjoyable shopping experience for your customers is essential. However, even most top-rated systems don’t carry all these functions. Typically, a manufacturing software solution relies on third-party applications or simply does not support the functionality at all. If you’re looking for an inbuilt eCommerce platform from your manufacturing system, you need to look closely for it. One of the biggest benefits of cloud deployment is that it gives users real-time visibility. Being able to see what’s going on in your plant is highly valuable. Cloud-based products come with a number of other benefits, like scalability, relatively low-cost implementation and increased mobility. Typically, buyers choose on-premise because they believe it to be more secure. While implementing a system on your own servers provides you with more control, it doesn’t necessarily mean more security. Today’s cloud-based systems are very secure and can be harder for hackers to exploit, since they cannot test their attacks on a private server. But the needs of every company are different, and only you know what’s truly needed. Now that you have an idea of what your business needs in a manufacturing software solution, it’s time to start comparing vendors. We recommend using our in-depth comparison report, which lists all the top manufacturing vendors. Our analyst team ranked and scored each product based on how well it meets top requirements. See which vendors meet your most important requirements all in one place. But if you’re not ready to look at vendors just yet, we also provide a customizable requirements template. Use it to gather all the requirements your business needs, then invite stakeholders to edit as necessary. What did you think of our list of manufacturing software features and requirements? Are there any that we missed? Feel free to leave us a message in the comments down below!